SEEING asylum seekers struggle to fill out a “deliberately impossible” visa application has motivated a Catholic school graduate to give child refugees a better chance at staying in Australia. 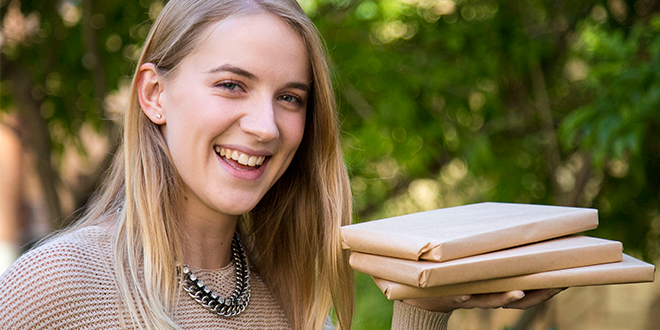 All Hallows’ School graduate from 2014, Rory McGahan, is the co-founder of The Unknown Project, a new Brisbane-based initiative that sells wrapped second-hand books to buy school resources for young asylum seekers. The initiative hopes to teach Australians not to “judge a book by its cover”. Ms McGahan started the charity in February while volunteering at the Asylum Seeker Clinic, operated in Brisbane by the Salvos Legal Humanitarian, and Multicultural Development Australia. The 20-year-old law student and part-time paralegal helped asylum seekers to complete their protection visa application forms, which they are required to fill out within 60 days. Ms McGahan said asylum seekers, many with poor English skills, were asked to answer questions that “I couldn’t answer, and I speak English and am very well educated”. “It does feel like the policies that governments, including the previous governments, have in place are deliberately dehumanising and deliberately non-transparent to make it unappealing for people who have come here to stay,” Ms McGahan said. Ms McGahan said nearly all asylum seekers she helped had made terrifying journeys to Australia in the hope of being welcomed into the country. “One of the questions at the end is why did you choose to come to Australia as opposed to anywhere else,” she said. “Almost everyone that I worked with at the asylum seeker clinic had the same answer, and it was that I would be welcomed here. “It was so heartbreaking to read that so many times, and to imagine them going through so much trauma in their home countries and unbelievable danger and fear, and then trauma again coming here only again to be told that they’re absolutely not welcome, we’re going to stick you essentially in prison for a few years. That something is The Unknown Project, which Ms McGahan started with fellow law student and best friend Olivia Roney after they met at a brief study internship where “we would talk about the whole crisis”. “Part of the whole point of The Unknown Project was we felt it was a metaphor for how asylum seekers and refugees are treated, kind of like, don’t judge a book by its cover,” Ms McGahan said. The pair has started selling books “lucky-dip style” inspired by Blind Date Books where books are wrapped in paper so buyers can’t see the cover. All proceeds from sales go towards buying school resources for child asylum seekers learning English at the Brisbane Romero Centre. 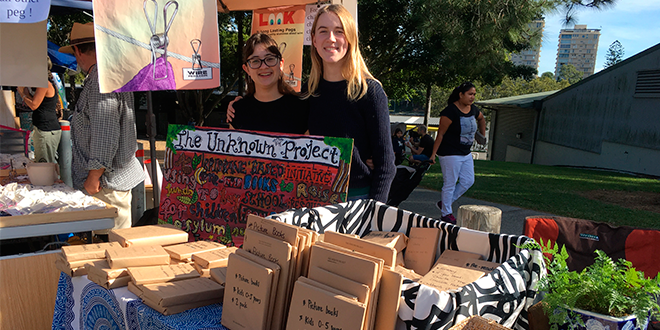 The Unknown Project’s first two sales in Brisbane paid for 16 stationery packs, which were handed to the Romero Centre in late June. Refugee support: Rory McGahan and Olivia Roney at one of their book sales in Brisbane. Photo: Supplied. Ms McGahan said The Unknown Project focused on facilitating education for refugees because she and Ms Roney’s education “will be the number-one thing that lets us have the lives that we want to have”. A recent award of $5000 from Ms McGahan’s alma mater will also help the charity expand. On September 1, Ms McGahan will be the second annual recipient of the Dr Lee-Anne Perry AM Leadership and Service Award. Named after All Hallows’ first lay principal, and established by the school’s Parents’ and Friends’ Association and Mothers’ Network, the award encourages past students to develop their leadership and service opportunities. Ms McGahan will use the funds to buy tablets for the Romero Centre, and attend training and leadership conferences on social enterprise to expand The Unknown Project. She said her education at All Hallows’, which was founded by the Sisters of Mercy, was a strong factor in her support for refugees and asylum seekers. “The Mercy values is definitely what’s motivated me not just to want to help out and sign petitions on Facebook but feel more like it’s a duty, an obligation,” she said. The Unknown Project is planning to sell its books at an upcoming suitcase rummage in Brisbane city in October. For more information search The Unknown Project Australia on Facebook.